Morehshin Allahyari, Anna Ridler, Cat Jimenez, Benjamin Weber, Arno Deutschbauer, Herwig Scherabon, Lukas Fliszar (101), Michael Ari (101), nita., MNCLR, Litto, OMAi Tagtool, Dalia, Joja, Hidéo SNES. To kick off a new year of audio visual art, sound:frame visits the Reindorfgasse with a collaborative exhibition from January 10 to 12. With „Translation of Complexity“ the exhibition addresses intertwined topics and complex narratives through art. 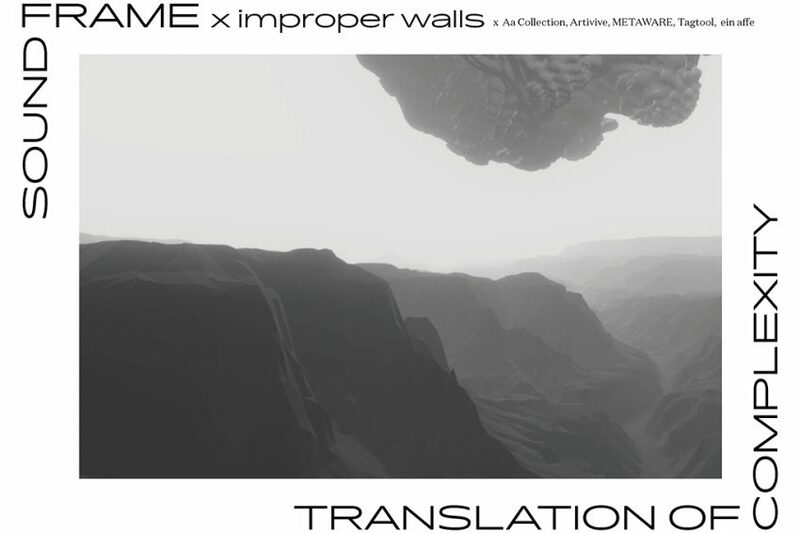 Together with improper walls, sound:frame invited a bunch of artists who break down the seemingly ungraspable framework of artificial intelligence, permutation of the internet and the role of myth and traditions in today’s society. Seven different venues are part of this weekend long group exhibition. With SHE WHO SEES THE UNKNOWN Morehshin Allahyari shows her work on digital colonialism and re-figuring as a feminist and activist practice at Aa Collections. Anna Ridler visualizes the fragility of a currency through showing the parallels between the 17th century tulip-mania and cryptocurrency today. Artivive’s featured artist Litto presents her understanding of disruption and error messages. At Improper Walls Cat Jimenez and Benjamin Weber explore the internet through a three dimensional digital sculpture, embodiment and performance. Visitors are able to step into the VR experience Afterlife, a collaborative project between Arno Deutschbauer, Herwig Scherabon, Lukas Fliszar (101), Michael Ari (101). In the basement of metaware vault MNCLR literally looks at hidden processes of memory and imagination. Last but not least at ein affe, Nita explores the liaison between the spectator and the artists through audio visual poetry. For the opening evening on Thursday, January 10 OMAi open their artist studio to show new tagtool features. Let’s continue our conversation at the Rhiz after party starting at 10pm where Dalia and Joja with visuals by nita. will make our heads nod and booties bounce. We will close this audio visual intermezzo on Saturday January 12 with the Alien Drag performance by Hidéo SNES. 22:00 Dalia DJ Set with visuals by nita. 00:30 Joja DJ Set with visuals by nita.